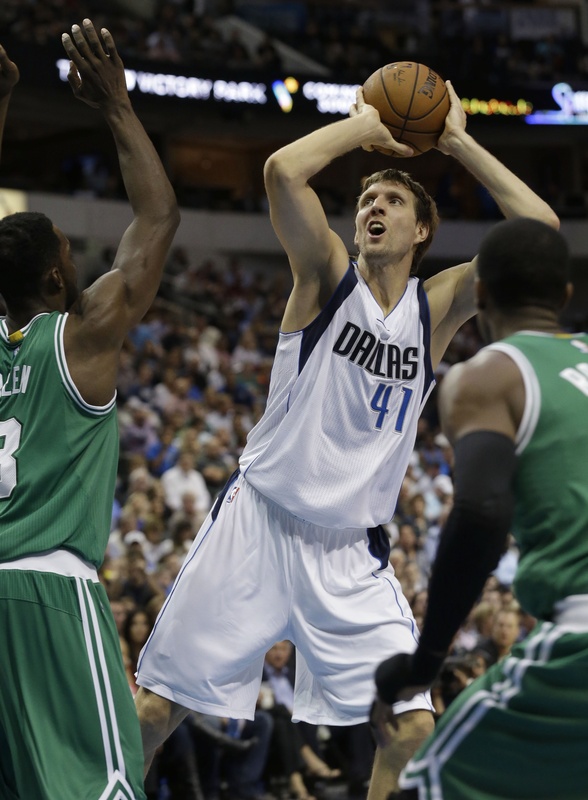 NBA: Chandler Parsons scored 29 points, including a key 3-pointer, to help host Dallas beat Boston 118-113 Monday night. Avery Bradley had a chance to tie with three free throws when he was fouled on a 3-pointer by Monta Ellis with 39 seconds left after Boston trailed by 31 in the second quarter. But he missed the second one. After Ellis put Dallas back up by three at 116-113, Parsons won a jump ball with Jared Sullinger, tipping it to Ellis, who was fouled by Rajon Rondo on a drive and made both free throws. • Nets beat ailing Thunder: Brook Lopez scored 18 points in his first regular-season game in about 11 months, and Brooklyn routed injury-depleted Oklahoma City 116-85 in New York. Alan Anderson added 18 points and Deron Williams had 17 points and nine assists for the Nets. Reggie Jackson scored 23 points in his season debut after missing the first three games with a sprained right ankle, but the Thunder left just as short-handed as they entered when starting guard Andre Roberson sprained his left foot. • Rockets beat winless 76ers: James Harden had 35 points and nine rebounds and Dwight Howard added 11 points and 14 rebounds to lead visiting Houston past Philadelphia 104-93. Trevor Ariza hit six 3-pointers and scored 24 points to help Houston improve to 4-0. • Clippers defeat Jazz: Blake Griffin scored 31 points, Jamal Crawford added 19 to go over 15,000 in his career and Los Angeles defeated visiting Utah 107-101. Chris Paul notched his first triple-double with the Clippers, finishing with 13 points, 12 assists and 10 rebounds. • Grizzlies handle Pelicans: Marc Gasol scored 16 points, Zach Randolph had 15 and Tayshaun Prince added 14 as the Memphis Grizzlies extended their home winning streak to a franchise-record 16 straight with a 93-81 victory over New Orleans. • Kings hold off Nuggets: Darren Collison scored 21 points, including three free throws in the final 16.2 seconds, and Sacramento beat host Denver 110-105. NCAA: Bloomington police say Indiana forward Devin Davis was mostly to blame for a weekend accident that sent him to a hospital with a head injury. Davis was injured Saturday morning when he was hit by a car driven by teammate Emmitt Holt. According to the police report, Holt said Davis “jumped” in front of the car as he tried to drive away. Police cited “pedestrian’s action” as the primary cause and said both players had been drinking. There was no update on Davis’ condition from the team. But a team doctor said Sunday Davis had “normal” speech and the use of all extremities. Holt, 18, was cited for illegal consumption and operating under the influence of alcohol under age 21. Davis, 19, wasn’t cited. NHL: Vladimir Tarasenko scored in the third round of the shootout and St. Louis stretched its winning streak to five with a 4-3 victory over host New York. Tarasenko, who had a goal and an assist in regulation, fired a shot past Cam Talbot to end the game. • Ference suspended: Edmonton Oilers defenseman Andrew Ference has been suspended three games for his check to the head of Vancouver forward Zack Kassian. TENNIS: Two-time defending champion Novak Djokovic has been handed a favorable draw at the ATP Finals, while Roger Federer and Andy Murray will meet in the round-robin phase. The top-seeded Djokovic was placed with Stan Wawrinka, Marin Cilic and Tomas Berdych for the season-ending, eight-man tournament, which starts on Sunday in London. Federer is in Group B along with Murray and newcomers Kei Nishikori and Milos Raonic. • Nadal undergoes surgery: Rafael Nadal had successful surgery to remove his appendix and will remain in the hospital for up to two days to recover. The surgery will cause Nadal to miss the ATP finals.